Judy Blume will be speaking at the University of Hartford on June 21st as a fundraiser for The Mark Twain House & Museum. I’ll be interviewing her onstage and taking tons of audience questions. In preparation, I will be reading her complete works and blogging about the experience. Get your tickets here. "Deenie is my jam," said the most fun person I know, a local television producer in Connecticut. This was several months ago, when I told her that Judy Blume was coming to the Twain House this summer. 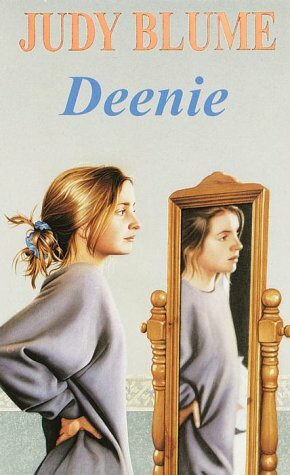 I had never heard of Deenie. It seems that everyone who's read Judy Blume has a different favorite. And everything I heard about Deenie signified it would be a Big Blume Book: scoliosis, back brace, masturbation. I don't know what I was worried about. Deenie's major issue is not scoliosis: it's that her mother is constantly reinforcing her expectation that she will be "the beauty" of the family while her sister will be "the brains." The scoliosis plot twist isn't used as a "woe-is-me-I'm-a-voctim" device; instead, Deenie's back brace is instead a physical tool to help her deal with and stand up to her mother's expectations. It's rare for a Blume parent to be entirely unsympathetic, but Deenie's mom is. I'd find it unrealistic, but then my memory snaps back to a friend's mom saying things like "if you burp in public, how will you ever get a boyfriend?" These moms are out there. As a girl who fell much more on the "brains" side of this dichotomy, I was pleased to see brainy old Helen standing up for herself late in the novel. "Oh Ma...you're impossible! God didn't give me a special brain. You made that up. And you almost convinced me, Ma...you almost did.... I used to tell myself it didn't matter if I wasn't pretty like Deenie because I have a special brain and Deenie's is just ordinary....but that didn't help Ma....it didn't help at all....because it's not true!" "Deenie's not conceited, she's just passive—a very minor flaw that, as Blume knows, in the long run can have far more dire results than excessive self-regard (which, unfortunately, kinda works in one's favor). Ironically, it's Deenie's brace that frees her from the invisible brace her mother was setting up for her, an adolescence locked into a role that would have derailed her growth as a real person." Another classic down the hatch. Oh, and the masturbation? Totally minor. Totally secondary to the bigger questions at hand. Totally ordinary. Just like it is in real life.